“Of all small businesses started in 2011, 4 percent made it to the second year, 3 percent made it to the third year, 9 percent made it to the fourth year, and 3 percent made it to the 5th year” – Startup Statistics, smallbiztrends.com. In simple terms, that means only 3 out 100 businesses make it beyond the 5th year. How long has your business been in existence? Consider! These early stage businesses don’t just fail. It always starts with symptoms that, if ignored, lead to failure. The most important symptom of an impending failure is insufficient cash flows or failing to make ends meet. There are numerous causes for this and from the same article quoted above, the number one reason is incompetence. The American English Dictionary defines incompetence as the inability to do something successfully or ineptitude. Simply put, most early stage business owners simply don’t know how to or are unable to run their businesses successfully. As a result they struggle to make ends meet. What does it mean to not make ends meet? you are struggling with debts. One particular area that most early stage business owners struggle with, is not knowing what to do when. Most do not know that every business goes through 3 major growth phases, if it is to reach it’s full potential. Similarly, every human being starts life at conception and grows stage-by-stage to adulthood, without skipping a single stage in between. Likewise, a business goes from conception to maturity without skipping a single stage in between. 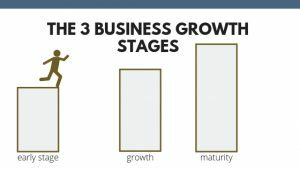 There different variations of business growth stages, anything between 3 and 10, but the 3 major ones are the formation or early stage, the growth stage and the maturity stage. Let’s take a brief look at each one. This stage consists of the idea to start a business, finding a problem worth solving for a large enough market, creating an initial solution/product, finding initial clients, and achieving market acceptance. This stage consists of growing customer numbers, revenues, market share in a big or fast growing market, head count, operations and/or multiple geographical presences. At this stage the business is well-established and strong, has achieved great and continuous growth, has captured a significant share of the market, and is regarded as one of the foremost market leaders. The reality is that a new business or service, is like a new technology. There is a chasm or gap between the early stage and the growth stage, as illustrated by the diagram above. The problem is that most early stage business owners operate their businesses as if they are in the growth stage. They sell to wrong clients in a wrong way. Just like a human being at the early childhood stage has to do certain things well to develop to the teenage stage, so must a business. An early stage business owner has to do certain things very well at this stage of the business, in order to cross the chasm or gap between the early stage of the business and the growth stage. If they don’t, they get stuck and eventually fall into the chasm, into obliviousness – the graveyard of most early stage businesses. The reason for this, is that people who buy from an early stage business are not the same people who buy from a growth phase or matured business. People who buy from early stage businesses are called innovators and early adopters. People who buy from growth stage businesses are called the early majority and the late majority. People who buy from maturity stage businesses are called laggards. Innovator and early adopter clients are very few and have a very high risk appetite than the rest. They are willing to give an early stage business a chance, for one reason or another. Herein then lies the problem for early stage business owners. They try to sell to growth and maturity stage clients (the early majority, the late majority, and laggards), who will never give them a second glance. In other words, they are trying to run before they can crawl. That leads to insufficient, inconsistent and unpredictable revenues. The reason is that you can’t outmuscle well-known, established and widely accepted businesses in their markets. You first have to be well-known, established and widely accepted, before they can buy from you. They will then nitty-pick and mourn over every little pet peeve they perceive as poor delivery. The consequence of not knowing who are the right clients for your business and how to sell to them, is finding yourself working with such clients and struggling financially as a result. What should an early stage business do then? As an early stage business, you have to know what to do and when. In short, the right action at the right time. When you do, you’ll start to generate sufficient income, be able to make ends meet and draw a proper salary from your business. As an early stage business owner you should acknowledge and pay due regard to the fact that there is a gap between the early stage and the growth stage of a business. That gap cannot be easily crossed without first preparing to cross it. There are 5 steps an early stage business can take to cross the gap to the growth stage side, and they are Step 1: Discover Right Clients, Step 2: Package Must-Have Solution, Step 3: Gain Sufficient Clients, Step 4: Launch Must-Have Solution, Step 5: Become Widely Accepted. Let’s take a brief look at each step. This entails focusing on a narrowly defined customer segment, discovering their most pressing problems and developing a must-have solution for their most pressing problems. Here you focus on defining and developing features of your must-have solution that solves you client’s top 3 most pressing problems. You avoid, at all costs, developing any features that your clients say they don’t need or define as nice-to-have. At this step you will create an elegant and repeatable way of getting the right client, create a marketing website, setup social networks, setup a referral partner platform, setup a system to support clients, sell to the right clients face-to-face first, and setup a way to track your client related numbers. Here you will officially release your solution to the public using means that fit your business and personality. As early stage business, it’s unlikely that your launch will be a “big bang” Apple-like release, but a more symbolic launch date that signify the availability of your solution. The focus of this last step is to make sure that you create a solution that people in your market want in large enough numbers. It involves managing the development of your solution features in a way that spirals towards market acceptance by early adopters. Once you achieve wide market acceptance, your early adopters will drive your business into the growth phase. Of more importance, is for you as an early stage entrepreneur to understand that there is a gap from where you are and the next stage. Remember, incompetence is the inability to do something successful. Ignoring paying due regard to the growth stages of your business will keep you stuck and unable to make ends meet. To cross that gap, start preparing for it using the 5 steps highlighted above. To get started, learn more about Crossing the Chasm: The 5 Steps to Generating Sufficient Income from the Right Kind of Clients Predictably & Consistently.